On a windy, tactical day of racing at Sea Otter Classic, Blevins fires off a winning attack on the final lap to beat the Canadian duo of Disera and L'Esperance. 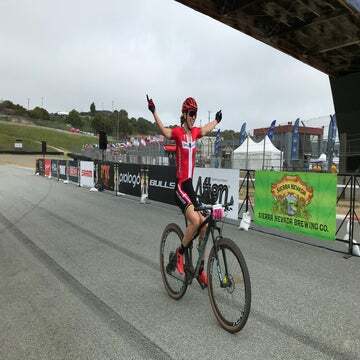 MONTEREY, California (VN) — He was covered in scabs, with stitches in his chin from a crash at last weekend’s Pan American Championships, but Christopher Blevins (Specialized) was relentless in the Sea Otter Classic XCO on Thursday, finally breaking away on the last lap to win. “This is definitely my best pro win in the U.S.,” he said. From the start of the eight-lap race, Blevins was on the attack, getting a small gap on the course’s steepest climb. Peter Disera was second, and his Norco teammate Andrew L’Esperance finished third. 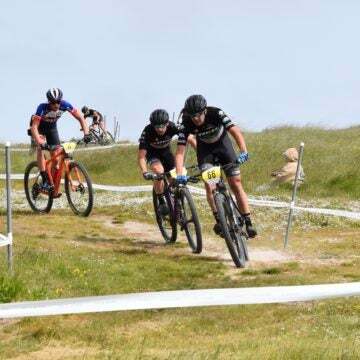 However, with windy conditions throughout the day, the race was bound to be a tactical one with a significant group of about six to eight riders leading throughout the 40-kilometer race. He and his fellow Canadian Andrew L’Esperance tried to break apart the front group but to no avail. The action all came down to the final lap, and Blevins was ready to make his move. Throughout the day, he had been testing his rivals with a few accelerations on the steep climb, but was also careful to save his energy in the windy conditions. “I tried to stay out of the wind. Thankfully we had a tailwind [on the climb] and that helped,” Blevins said. He launched his winning attack on the hardest climb and had enough of a gap on Disera to hold on for the final kilometers. Disera said he did everything he could to position himself for that decisive climb through the meadow above the Sea Otter venue, but he couldn’t match Blevins’s acceleration. For Blevins, the victory was a special one because he has been coming to race Sea Otter since he was a junior. His father Field was there to watch him earn one of the biggest wins in his young career. “I’ve never heard him scream so much; I’ve never heard my dad cuss!” Blevins said with a laugh at the finish.